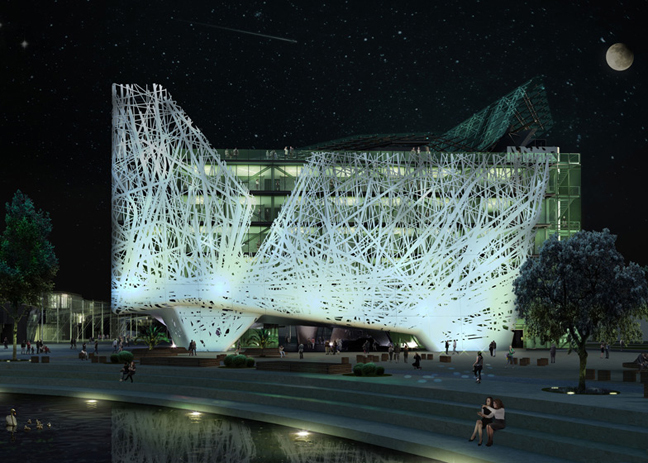 Italy has become the latest nation to unveil proposals for the Milan Expo 2015, which include a pavilion with an air-cleaning facade designed by Roma studio Nemesi&Partners to resemble tree branches. 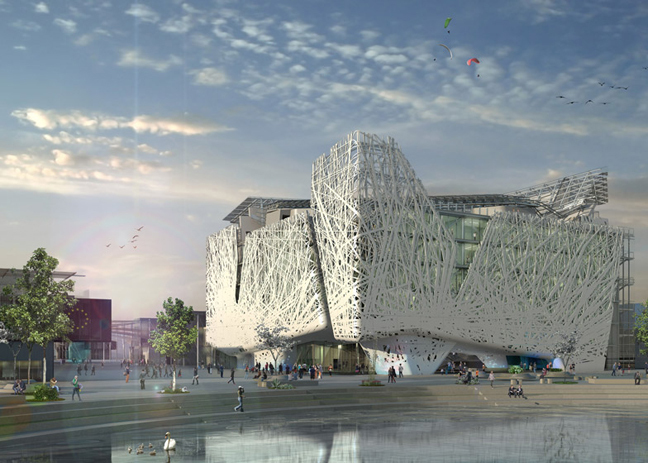 As one of the few expo structures that will remain on the site after the fair is over, the Palazzo Italia will comprise a six-storey building with an intricate lattice skin conceived in “the image of a petrified forest”, according to Nemesi&Partners. The architects plan to create the facade using a bespoke air-cleaning cement patented by material manufacturer Italcementi. “In direct sunlight, the active principle contained in the material ‘captures’ certain pollutants present in the air and converts them into inert salts, helping to purify the atmosphere from smog,” said the studio in a statement. The pavilion’s interior will centre around an open square, which will form the start of the exhibition. It will be surrounded by four blocks connected by bridges, creating exhibition and events spaces to the West and South, and offices and meeting rooms to the North and East. The building will also feature a vaulted roof built from steel beams and photovoltaic glass panels. 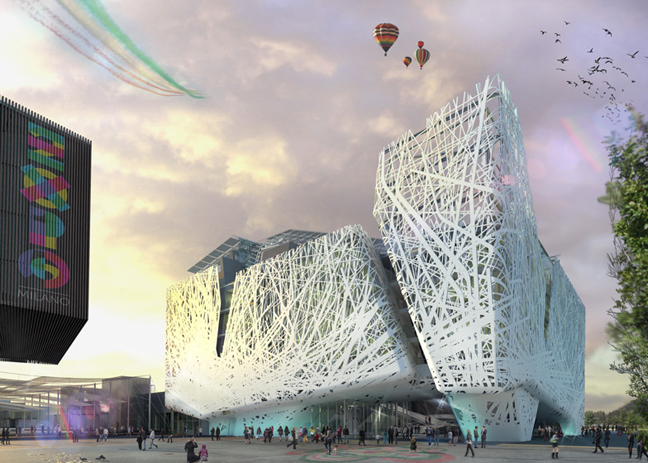 Nemesi&Partners will collaborate with engineering firms Proger and BMS Projects and sustainability consultant Livio De Santoli to deliver the building in time for the expo, which takes place between May and October 2015. 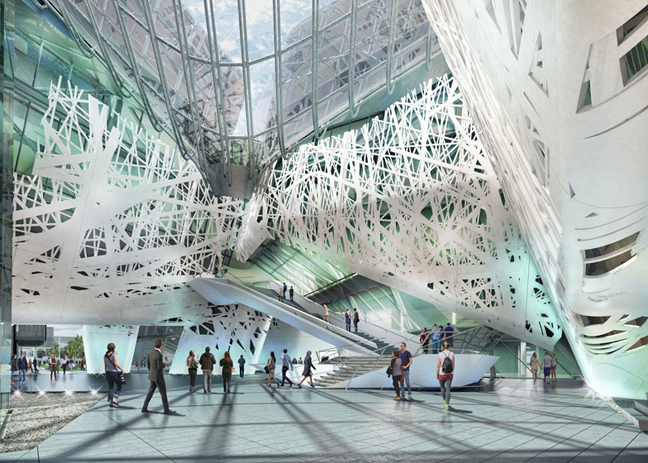 On May 1, 2015 will inaugurate the Milan Expo. A year before the universal expo and one year (May 2013) after the winning of the international competition launched by Expo 2015 SpA for its design of the Italy Pavilion, Nemesi&Partners, winner of 68 international studies participants at the competition, summarises the architectural project. The architectural concept of the Italy Pavilion project by Nemesi&Partners is an urban forest. Palazzo Italia is inspired by a natural architecture in which the branched weave of the external “skin” of the building generates alternations of light and shadow and solids and voids, creating a scenario that refers to works of Land Art. Palazzo Italia is designed in a sustainable way, thanks to the contribution of photovoltaic glass in coverage and photocatalytic properties of the new concrete for the entire outdoor surface obtained thanks to the TX Active patented by Italcementi. In terms of its location and architecture, Palazzo Italia will be a landmark within the Expo site and one of the few permanent buildings post-Expo.